Love the look of this ring. Very pretty. Thanks. 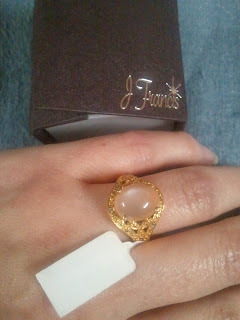 Love the Moonstone ring use to wear them when younger would love to win this one! If anyone has a problem - examples; can't see the entry form, or it will not let you log in to enter, etc. Please let us know. I would like to get a ring like this in a size 9. 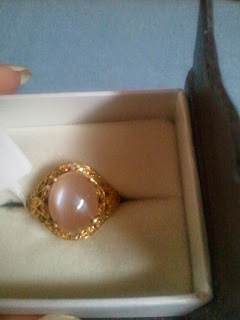 Thank you 4 this awesome opportunity 2 win this beautiful Moonstone Ring :D I have my fingers crossed! Good luck everyone! This is a beautiful stone complimented by a pretty setting. I would love to see it in person! I only have one of this type of ring - and, unfortunately, it is a size 6. Anyone needing it sized up/down could see a jeweler. Perhaps wouldn't cost much. SO pretty! You know, I have a lot of jewelry- I do not need anymore, I really do not! BUT I have a TON of little girl grandkids now and wow do THEY love my jewelry, so I love to give it away to them now! They enjoy it! I enjoy giving it to them! Beautiful ring, would love to win it. Beautiful.. would love to have one,,, size 6 ,, Hope i win !! I would just love to have that pretty moonstone ring. That is a stunning ring! would love to wear it! I would love to own that stunning ring! The Moonstone is beautiful just like seeing a full moon. I know my daughter would love to wear this every day.Thanks for the opportunity!! I love Moonstone, it is one of my birthstones too! I would love to win this it is so pretty!!!!! We will not be posting any more comments from "Anonymous" users. So if your comment was rejected - this is why. Also - I want to thank everyone who has commented so far. I agree - it's an absolutely gorgeous ring! I hope to win this and give it to my mother as a gift. Its gorgeous! This is an AWESOME Ring!Love the Moonstone!Thanks for the chance to win it! Beautiful ring! Thank you for your generosity! Beautiful would love to win this ring! Would love to win. I moved recently and all of my jewelry was stolen by the movers! I love this ring! Thank you for the chance! The moon goddess would love a moon ring! Thanks so much! This is absolutely beautiful! Thanks so much for the chance to win! Thanks for the chance to enter your giveaway. And the perfect size, too. I love the ring it looks so pretty! Nice simple ring, but still pretty. The moonstone depicts a great example for my intention: I hope to maybe pop the question as I give a surprise picnic on the beach! Such a ring, would sparkle in that of the moon light so that it brings out its true glow! This ring is a statement piece. i really love it! i need rings...I lost everything I owned in a fire last year that destroyed my community and my pretty jewelry is gone! Pretty ring! I'd love to win it! There is only 1 ring, and it is a size 6. Sorry. I love moonstones. It's beautiful. Thanks for giving it to a lucky winner. Beautiful moonstone ring! Very elegant but simple! This would be great for my wife! That is sooo elegant. I really love it. Love the ring! Thanks! Guess it will go to my daughter or granddaughter if I win because it sure won't fit on my fat fingers! LOL! This is beautiful, I wouldn't mind winning this!!!! It is a beautiful ring that will go good with almost anything! This is a beautiful ring! Can wear it anywhere. Very pretty, could be worn with a number of colors. I would love to have this ring! It's beautiful! Great giveaway! We only have 1 to giveaway, and unfortunately it is a size 6. That Moonstone ring looks Gorgeous! Moonstones are beautiful, I love this ring! I wear a size 6! this is such a pretty ring. I hope I win this ring so I can giv it to my daughter. It is a very pretty ring. I love moonstone. I have always wanted to have a moonsonte ring as sa child and this is a gorgeous one and in my size too how lucky could I get??????? o rea;;y hp[e that I win this one its so beautiful. Love the fancy look! It is simple yet stunning! Tracyboz66 has been selected the Winner and has 3 days to reply to the email we have sent or an alternate winner will be chosen. Alternate Winner has been chosen. Information of Winner can be found on the Winners Page.